I have been dining out with my girlfriend, Diana, just moved back to Vegas, and we have been celebrating her homecoming by eating our way through the vegan restaurants in Vegas. We went to brunch at Vegenation a couple weeks back, and we ordered a Tiramisu french toast special. We were basically obsessed with it. Vegenation is one of my favorite vegan restaurants in Vegas; they have such a cool, downtown vibe and very flavorful food. As many of you know, all my website recipes are plant based and oil-free. I wish more restaurants would provide oil-free menu items, but we are making progress. I am going to assume that the french toast from the restaurant was not oil-free, so that is why I wanted to make a healthier version at home. I already have a recipe for homemade Nutella (Not-ella as I like to call it!) My Not-ella is healthy, dairy free, and refined sugar free. It tastes absolutely delish! I thought that it would be deliciously decadent on top of french toast. 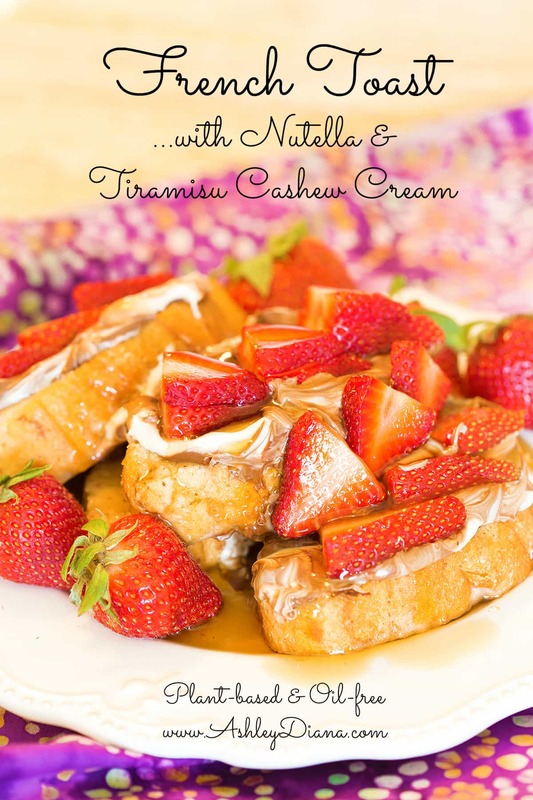 The best part of this recipe is that the french toast is SO easy and quick to make! The homemade creams take a little extra time to make, but if you want a super quick french toast topped with maple, this is it! In the bakery at Whole Foods, I found an oil-free french bread that is perfect for this recipe. Feel free to use your favorite type of bread! 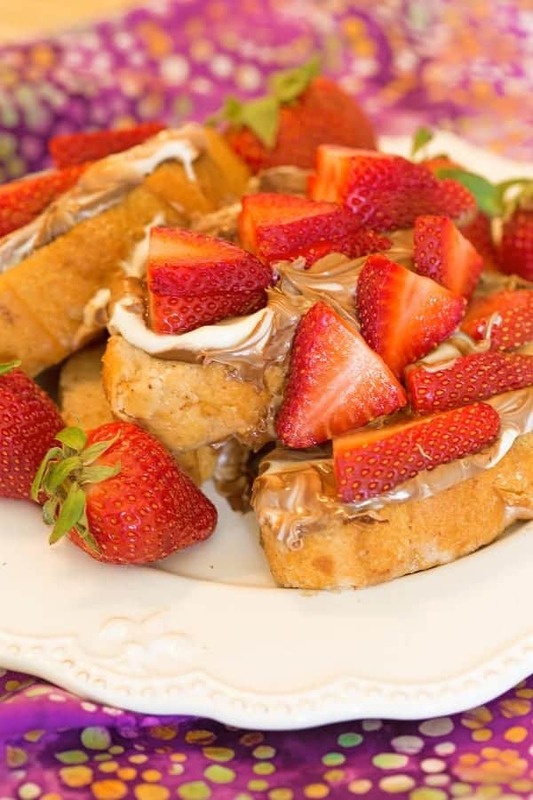 Try this french toast recipe with any of your favorite toppings. It is just as delicious simply topped with fresh berries and maple! Slice Bread 1 inch thick. Coat each side of bread slice with mixture. Sear each side of bread for about 1 minute on each side. Serve with maple syrup and/or top with nutella & cashew cream. Soak cashews in water for at least 4 hours. Drain cashews and combine with all other ingredients in a high powered blender. Preheat oven to 350 degrees. Place hazelnuts on baking sheet and bake 12-15 minutes. Not any longer or they will burn. To remove the skins, after they cool put 2 pieces of paper towel in a gallon ziploc bag and pour the nuts in between the two towels. Seal the bag and rub away! The dark skins will rub off. It works great and no towel to wash! Blend all ingredients together in a high powered blender until smooth! What kinds of toppings do you like on your french toast? Oh my gosh, nutella and tiramisu were two of my favorite things before I had to give up dairy. What a creative, idea, Ashley! I have to try these! YUM yes me too!! I freakin LOOOOVE Nutella. I think you’ll really love this recipe! xo!